The Tartan Trio: Schoolgirl Sweetheart! As you’ve definitely already guessed, today is part two of my tartan trio series. This outfit is probably one of the cutest in my wardrobe right now and whilst I do question if it holds too much red, part of me doesn’t care anyway as it’s adorable. Red is also one of those colours that I feel is fashionable in every season and suits every skin tone. If you’re pale, it gives off porcelain snow white vibes. If you’re tanned, it accentuates that sun kissed glow and don’t even get me started on how incredible black ladies look in red dresses! I feel like this outfit brings together vintage and modern patterns and styles so perfectly. The tartan pinafore gives off a schoolgirl vibe, just much more fashionable. So I feel the most prominent thing in this outfit is the tartan pinafore and this little number is a recent addition to my wardrobe from New Look. It was £22 which I feel was a fair price for the item due to the quality of it. The material is super comfortable, soft and stretchy making it really flattering and easy for every day wear. New Look are absolutely KILLING the game with their Autumn additions, especially the tartan pieces so I’d urge anyone looking for a wardrobe revamp for a decent price to have a browse of their site. I can’t describe how much I adore the print of this shirt. I remember it popping up on my Facebook timeline on an advertisement and 5 minutes later it was on its way to me. Great will power, Al. This is the Love Will Tear Us Apart Heart shirt from Nasty Gal and as much as I’ve said I love the print, I’m not best impressed with the material. It’s a bit too stiff for my liking and doesn’t fall well unless it’s underneath or tucked into something. That being said, It does look really funky under most of the pinafores I own and also pretty fabulous tucked into a pair of high-waisted jeans so I can say I’ve got enough wear out of it for the price. The print also takes the outfit away from the schoolgirl vibe and adds a fun and cute element. I also used to be a little obsessed with Nasty Gal and the unique clothes they offer but I’ve noticed recently that every item I seem to like on their site only goes up to a size 12. This has completely put me off of them to be honest. Not that I’d most likely be able to fit comfortably into that size most of the time, anyway so I don’t really have a choice as to whether I wear their clothes or not! It’s just such a shame as I own some such wonderful and staple pieces from them. The shoes are of course the famous and wonderful black Lazy Oaf x Dr Martens. I’m so happy we’ve got to this time of year now as I haven’t actually been able to properly break these in yet due to the heat wave this Summer. They are actually surprisingly comfy despite this and I am just as in love with them as I was when I first bought them. I am, however, considering selling the pink ones as I’ve realised they just don’t seem to go with anything in my wardrobe. Last but not least, the bag needs a mention. Unfortunately this sold out incredibly quickly when it went on sale so I’m not sure where you’d be able to find it now. It’s a River Island embroidered shoulder bag and I also have the matching purse to go with it! I adore that it’s the perfect mix of girly and gothic and adds such an edge to any outfit. I do wish the bag was slightly bigger though as it pretty much fits the matching purse in along with your phone, keys and not much else. River Island always tend to have some pretty gorgeous bags for sale and the quality of them always lives up to the price in my experience. I hope you enjoyed the second outfit, the third and final will be up soon! Are you a wearer of red? Jake Shoes Secret Santa Shoe Swap! "The Tartan Trio: Perfect Print Clash!" "The Tartan Trio: Presentably Punky!" Love this look! You definitely pull off the red color way more than I would! That dress is stunning & it looks ridiculously comfortable! You look great! 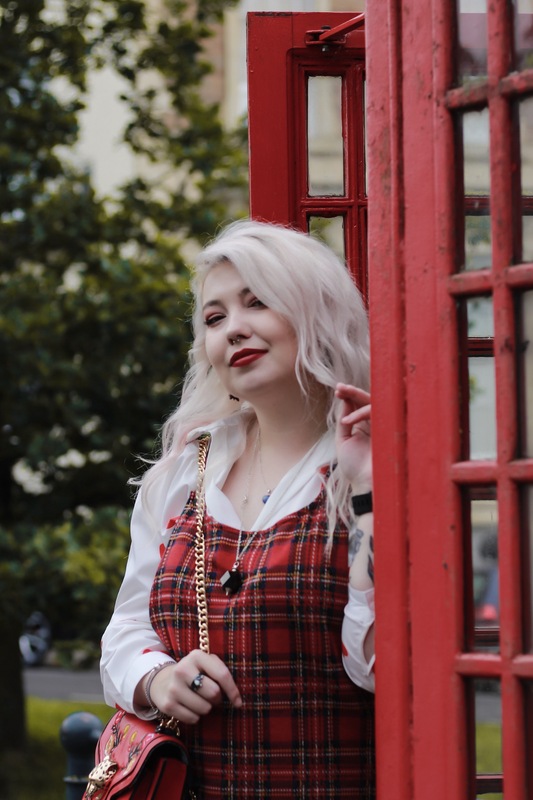 I absolutely love the tartan pinafore, I’m so obsessed with pinafores at the moment and every time I walk into New Look at the moment I just want to buy them all! 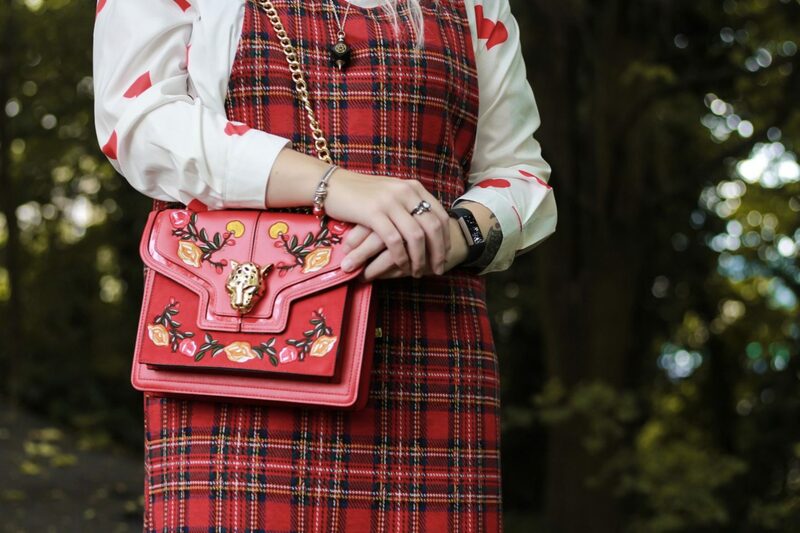 I’ve started wearing red a lot more this year and am LOVING everything about this outfit – shirt, dress, boots and bag are all perfect! I need to go onto the New Look site when I get paid so I can get me some tartan! I just LOVE your dress!!! And that purse is so cute! Thank you for sharing where you got it. I’ll def have to go take a look! This is too cute!!! Girl, you really do know how to put an outfit together! I’m obsessed with the shirt, shame about the fabric though. I always look on Nasty Gals website but can never find anything that fits well either. I’ll just stick to their shoes and bags 🙁 I can’t believe that bag is from River Island, it looks so expensive! It’s got a very Dolce & Gabbanna vibe about it. Well aren’t you just an adorable little button. I love the tartan trend and the moment and you’re absolutely smashing it!